Manipur fashion designer Asa Kazingmei made heads turn with his ‘Bionic’ collection at the Lakme Fashion Week. 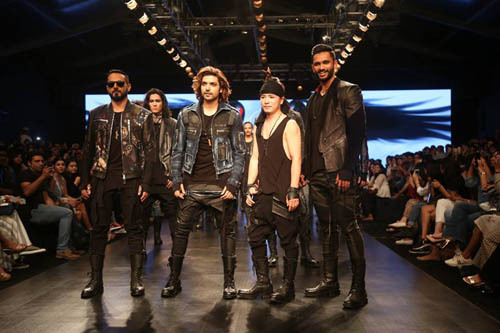 The talented designer showcased his collection at the Lakme Fashion Week (LFW), Summer/Resort 2019 season which kicked off on Wednesday, in Mumbai. Stars Gurmeet Choudhary and Nikhil Chinapa walked the ramp on the first day of Lakme Fashion Week for designer Asa Kazingmei. Asa’s collection was an ode to the future dresser’s dreams so his “Bionic” collection for men had all the hardware and space-age accruements that turn normal clothes into something extraordinary. His love for leather was showcased in collection, which when worn looked fierce and formidable (like a warrior). So, this season diverse leather options were embellished with studs and some fantasy painting that offered a new dimension to the apparel. Born in Lunghar village, Ukhrul district of Manipur, Asa came into limelight at the 2012 Lakme Fashion Week, where he showcased his collection for the first time under the ‘Gen Next Designers’. Bollywood biggies like Salman Khan, Hrithik Roshan, Akshay Kumar, Saif Ali Khan, Ajay Devgn, Varun Dhawan, Amir Khan, Katrina Kaif, Anushka Sharma, Kajol, Ali Bhatt etc have worn his designs previously. Not only that his creations have also featured in films like Sultan, Bang Bang, Dhoom 3, Humpty Sharma Ki Dulhania, Mirzya etc.